We use some pretty high tech tools to do our research. The following tools have been paramount in our work the past week or so and each one comes with its own special features. -Kneeling Pads–Now don’t get too excited here. Originally composing several camping mats (you know, the ones for under your sleeping bag? ), these mats got folded over and used to kneel on until they finally were just ripped or cut into smaller rectangles that are still used to this day in the field. Their character is apparent as they are laden with dirt and small stones in the indents made by years of kneeling. Regardless of their age, they save your knees in the field. -Forceps–These are self-explanatory. Glorified tweezers. -Wheel Hoe–Now this, folks, is the reason I’m writing this post. We used a wheel hoe in the field the other day. Why would we use any contemporary machinery when we have a wheel hoe? See the picture here that shows literally exactly what the contraption we used looks like. It’s an antique for sure. Try cultivating an entire field with it. I have a much higher respect for my farming ancestors after the blisters from that day. -Wood Sandwich Picks–Otherwise known as toothpicks. -Paper Bags–The lab has piles and piles of paper bags, some previously used to be reused, and some new. The bags are used to collect samples and there IS a proper way to close them, so please learn the technique. -Scuffle Hoes–These unique hoes, also called loop hoes, are brilliant. They are for the indecisive people in this world who can’t commit to either pushing or pulling their hoe. Please refer to the picture of Chuck doing the hoe demonstration for us at the field. -Metal Detector–For treasure hunting. Because, priorities. All kidding aside, this is probably the most advanced piece of equipment that we have used this summer in the lab and we used it to dig up metal washers in the buried seed experiment. -Watering cans–Let me tell you a story. Last week was a dry week. Without the water, the lettuce/galinsoga experiment we’ve been working on needed water desperately. In order to water the field, we needed to water each plant with half a liter of water that was carried from the water tank with watering cans to each plot. As if it weren’t enough that we were watering these 3200+ plants by hand, we got done with two reps and it started to pour. Moral of the story: Weed research, I’m realizing, is a lot of hard work–as I can imagine a lot of research is. It isn’t always as efficient as you might like, but the effort is necessary and worth it. -Laid a chicken-wire fence in said trench (in the rain). Helpful pointer: Synchronized stomping on both sides to secure the fence solidly in the ground is key. It’s really a two person job. -Marked hundreds of weed seedlings with toothpicks and thinned them using forceps. There’s really no comfortable way to sit and do that. I apologize for my dry humor. It’s not as bad as it all seems because I like working with my hands and being outside and I really have been learning a lot about research and post-grad work. Having an internship like this is helping me decide what kinds of careers I think I’ll want to pursue after graduation. And if you ever need someone to plant your lettuce or weed your garden, you know who to call. This week found me at a Worker’s Protection training for work with chemicals and an orientation about CCE, but it also found me digging up swallow-wort and screening seeds in the lab. After spending two weeks in the Weed Ecology lab, I have developed two ‘snap’-hypotheses (a little like snap-judgments) about research. 1) Research projects are repetitive and often tiring. That’s all there is to it. I will never look at a research paper the same–I know now that behind every research paper, there were likely students like myself or lab assistants that had to do some re petitive task over and over again, for a long time, to make it possible. If there were a word that put all of my work during the past week into perspective, that word would be ‘seeds’. The seed packets taken out of the ground for this year from the buried seed experiment were dried and we spent a lot of time screening the tiny, tiny seeds from sand. If you want to know what that’s like, imagine this: you have a bowl of tan sand with a quarter teaspoon of black sand mixed in. That’s what it’s like. You’re screening black, sand-sized seeds from sand–they’re only 0.6 millimeters in diameter. That being said, even though a project like this is tiring, obviously the excitement of the outcome of such a project still keeps people interested. The effort is well worth it. 2) Research requires a certain level of humor. One of the students in our lab has a project with plants that had to be all replanted because of timing. The weather wasn’t favorable for too long and her plants got too big, so we spent some time this week transplanting her second round of seedlings. Timing, weather, or other factors can ruin project plans in an instant and change the parameters or possibility of a project. Outcomes of a project can take an unexpected turn, but a person has to be flexible and willing to ‘roll with the punches’, if you will, with a positive attitude and unfailing optimism. Keeping a smile on your face keeps everyone a lot more motivated and focused. And to keep you optimistic, check out this little guy I found while weeding in the field yesterday. He’s grumpy–this is what not to do. My name is Christina Hall and I’m a rising senior in AgSci doing an Invasive Species internship this summer in conjunction with Cornell Cooperative Extension. I’m working in the Weed Ecology and Management Laboratory here in Ithaca this summer and will be working specifically with knapweed. Kaitlyn Anderson (another AgSci blogger) is the other intern working on the same project, but based in Saratoga. This week has been a whirlwind as I just jumped right in to my internship. I showed up at 8:45 on Tuesday morning and by 9:15 we were in the field cutting samples of rye and hairy vetch. Wednesday then took me towards Watertown where I helped to collect data on swallow-wort at Wehle State Park. Swallow-wort is an invasive species that has caused a great deal of concern over the last ten years. 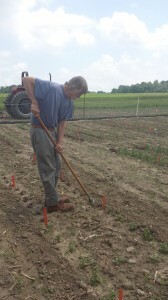 Learn a little more about swallow-wort and attempts at control in this article from the Cornell Chronicle featuring my supervisor and his colleagues. Thankfully, the weather has been perfect for field work this week and hasn’t left us dying of heat, because Thursday took us back out to the field where we continued work on a buried seed experiment and dug up seed packets from years past. Each packet contains one of four species of weed seeds with sand and simulates seed survival as affected by various cover crops. The seed packets–240 of them–were six inches deep into the soil and were found using a metal detector as each packet was attached to three metal washers. This week has helped me to casually get to know some of the people I will be working alongside during the summer and has offered a peek into some of the projects going on in this lab. I’m looking forward to some of the laboratory and other trainings I will have in the next week and am excited to get started on my summer project!